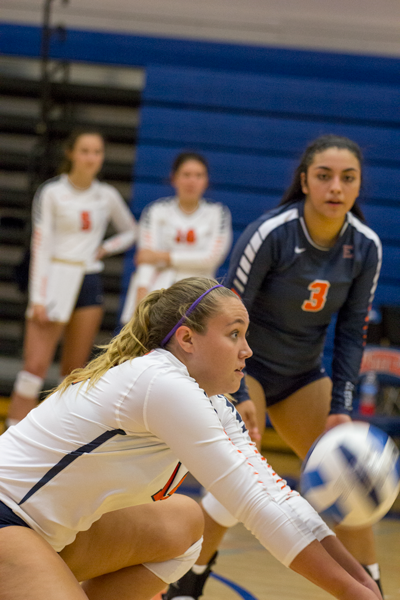 Eastfield’s shift to offering mostly eight-week term classes has placed new time management challenges on student athletes. Some athletes are having to take three eight-week classes at the beginning of the school year in order to meet the National Junior College Athletic Association’s requirement that students remain enrolled in at least nine credit hours during their season. This is more than the recommended course load, according to the Eastfield College website, which says students may not enroll in more credit hours than the total number of weeks their class meets. Taking two eight-week classes at a time is like taking four 16-week classes. Sophomore volleyball player Maura Munoz said she has noticed a faster pace in her classes this year, even in the first week. Athletics adviser Amber Sellers said some athletes run into common freshman struggles and fall behind, and the recent technology problems at the college have not helped. But eight-week terms mean the stakes have doubled. If a student were to miss two weeks, they could miss a whole month of work seen in a 16-week term. Student athletes who are taking the minimum nine hours and want to compete don’t have the option of dropping a course if they’re not doing well. Sellers said she has been trying to place athletes in two eight-week classes and one 16-week class to help balance their time. But sometimes it doesn’t always work out. Athletes have limited availability due to their practice schedule, and sometimes those classes fill quickly, leaving them with three eight-week classes. The reason why some athletes have to enroll in so many hours at the beginning of the school year has to do with NJCAA rules and the dates that flex-terms start. Some eight-week classes have been extended by about 30 minutes, meaning the volleyball team loses about two hours practice each week. The soccer and volleyball teams begin their regional tournaments during the first week of the second 8-week term. Head coach Brandon Crisp said his team would find a way to adjust to the changes. The athletes spend six days a week either in afternoon practice or at evening matches. This is an area where Sellers said flex-terms have helped. Athletic director Anthony Fletcher said adjusting to the changes is going to be a lot of work for the students. “But I think it’s feasible and I think it’s doable,” he said. He said the changes for basketball and baseball are good during the first semester. Those athletes don’t have to enroll in nine hours and know halfway through the semester if they need more credit hours to compete. Before, they would find out if they needed to take winter classes at the end of fall semester to qualify. Crisp said he wants students to be successful and pass their classes. He encourages them taking difficult classes after the season, along with online classes in which freshmen may not have experience. Freshman volleyball player Gabby Mise said she is taking three eight-week courses and one 16-week course in her first semester but doesn’t mind the fast pace. Sellers suggests that athletes check in regularly with their advisers and learn how to study early in their college career to succeed in flex-term courses. She said that getting students to register at the earliest possible time and having advisers who focus solely on retention during the first week would also be beneficial, because with eight-week classes the first week is important. Crisp said he knows of other colleges that have similar schedules, with eight-week terms and no Friday classes, and he believes it’s possible for the athletics program to be successful.